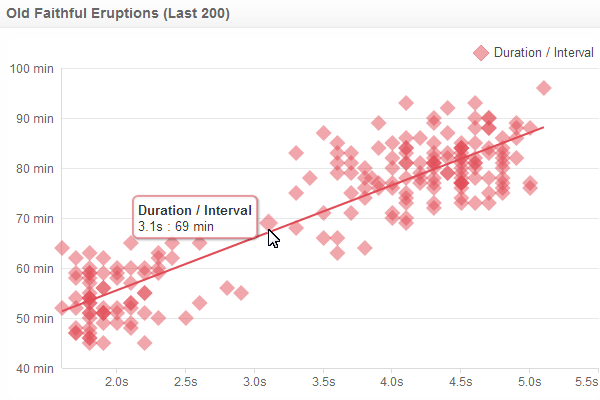 How to build Scatter/Bubble Chart components – How can we help you today? Overview Scatter and Bubble Charts allow you to show the correlation between two or three sets of data, such as test results, survey results, and demographics. The Scatter/Bubble Chart component allows you to show the correlation between two sets of data. To create a Scatter Chart, you will assign a set of X-values and Y-values so that the data can be properly plotted on the chart. Here is an example of a Scatter Chart that shows the correlation between volcano eruption duration and the interval for Old Faithful in Yellowstone National Park. The Bubble Chart allows you to show the correlation between three sets of data. To create a Bubble Chart, you will assign a set of X-values, Y-values, and Z-values so that the data can be properly plotted on the chart. The size of the bubbles is determined by the Z-values. 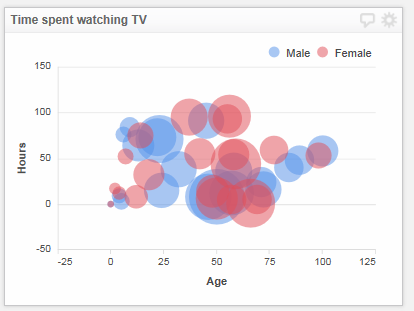 Here is an example of a Bubble Chart that shows the correlation between age, weight, and hours spent watching television for both genders. This section provides examples of different ways to use the Scatter and Bubble Chart components. The default chart type is a Scatter Chart. You can use the Properties panel to choose between a Scatter and Bubble Chart style. In the Klip Editor, drag a Scatter/Bubble Chart component into the Klip workspace. In the Component Tree, select Scatter Chart. On the Properties panel, select a Chart Type icon. In the image below, the icon that is highlighted represents a Scatter Chart. The icon that is not highlighted represents a Bubble Chart. Regression lines let you see correlations between X and Y values in a Scatter Chart. 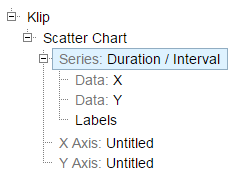 Select the relevant scatter Series from the Component Tree. 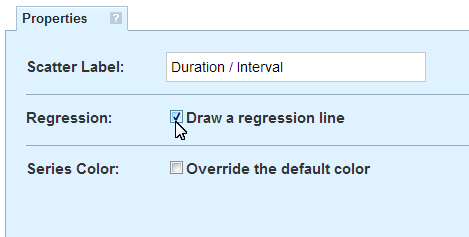 On the Properties panel, at Regression, select Draw a regression line. You can select a custom color for each series in a Scatter or Bubble chart. 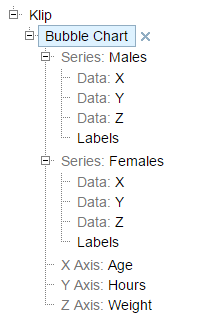 In the Component Tree, select the relevant Series. On the Properties panel, at Series Color, select Override the default color. 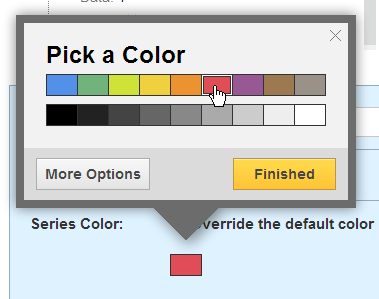 Click the color box to prompt the color selection window to open. Optional: For a custom color, select More Options. Type a hex value in the box. For more information, see Color-Hex (http://www.color-hex.com/). You can assign a name to each point or bubble in a series. The name you assign displays as a tooltip instead of the Series name. On the Component Tree, choose a series, and select its Labels sub-component. Select the Insert Function button. In the Functions menu, select ARRAY. Type a name for the first bubble. Repeat for as many values that exist in your X, Y and Z axis. You will need to add as many names as there are values to ensure all points or bubbles are assigned a unique name. Otherwise, some points or bubbles might be assigned to the Series name. Specifying the axis position, line, range and interval. Customizing labels and tick marks. Showing or hiding grid lines. Displaying the values of the Z-axis. On your dashboard, the hidden series will not appear until you click on the name of the series.